Every now and then a new critical parameter in EBSD analysis comes up. This parameter is often related to a new trend in materials science research or industrial development. One of the latest buzz-words is “nano”. Things are getting smaller and smaller and EBSD technology has to keep up to be able to provide the microstructural answers. This drive to investigate the tiniest details led, for example, to the emergence of transmission EBSD. But it seems that not everyone means the same thing when they talk about nano; Where does nano begin and where does it end? For example, is “nano” anything smaller than 1 micron, or anything below 100 nm, or perhaps only things smaller than 10 nm? The answer is of course: all of them. The feature scale really depends on your application and field of science. For example in natural geological materials, grain sizes smaller than 1 micron are not very common and such rocks could be described as nano-structures. But in semiconductor or photovoltaic applications nano may range from single atomic layers to perhaps 100 nm. In the EBSD community the emergence of nano-analysis has sprouted the use of another buzz-word: ‘resolution’. But exactly as with nano, ‘resolution’ can have several different meanings depending on who you talk to. So let’s start with the basics, what is resolution? The smallest interval measurable by a telescope or other scientific instrument; the resolving power. Of these definitions the first two have obvious relevance to EBSD analysis, but at the same time define something completely different. The first one deals with the feature size on the sample, whose limits are defined by the combination of SEM beam settings and physical sample properties. The second one describes the amount of detail observable in a diffraction pattern collected from an area of a sample, which is affected by the number of pixels available on the imaging sensor. These two definitions are easily confused, but are not directly related. And of course there is a third definition of resolving something which is a well-known strength of EBSD. It is the power to resolve the difference between different phases. For example here is a geological material, a granitic rock with several minerals with low-symmetry crystal structures. 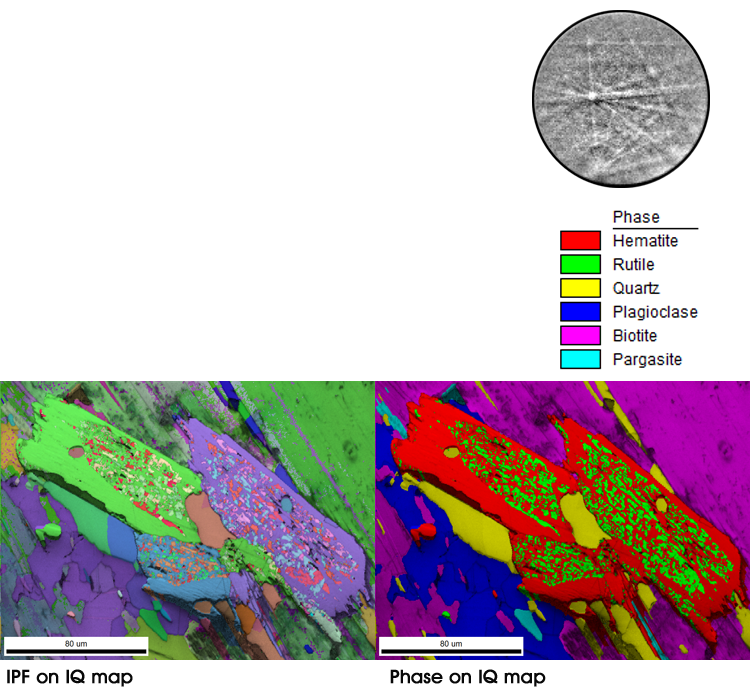 In order to resolve the phase differences, the analysis of a rock like this does not require any high resolution settings. A detector resolution of only 120 pixels and step size of 0.5 micron was sufficient. But things are not always what they seem at first glance as is illustrated by the sequence of images below. All these maps are collected with the same low detector resolution of only 80 pixels, but with very different spatial resolution, or step size, on the sample. The sample is a piece of the Gibeon meteorite, an iron meteorite that was discovered in Namibia in 1836. The structure is very coarse grained and the individual grains can easily be seen with the naked eye. But looks can be deceiving. My first attempt to characterize the structure resulted in a speckled map that looked pretty bad and made me doubt my polishing skills. Subsequent maps with higher and higher spatial resolution (i.e. smaller step size) started to resolve a fine-grained structure with many grains being smaller than 100 nm. So for this example, high spatial resolution maps were obtained using low resolution camera settings. For phase identification and characterization of deformation microstructures the pixel resolution of the detector becomes more important, but within reason. For phase identification you want to be able to identify small details in a pattern and this is also helpful when you are looking at small orientation changes due to dislocation structures in a material. This biotite pattern displays a pseudosymmetry where the difference between similar orientations is defined by the position of some relatively weak bands in the pattern. The correct indexing result is outlined in red. In such cases, what you need to identify the difference between these orientations is having enough pixels in the band pattern across the weaker and thinner bands to be able to detect them automatically. Therefore the band detection capabilties dictate the resolution that you need to resolve the difference between these two orientations and not the number of pixels that you have available on your EBSD detector. Typically a pattern of 200 pixels is sufficient on any material. And that resolution is also enough to be able to measure orientation changes down to 0.05 degrees, which allows accurate identification of subgrain structures as shown in the kernel misorientation map. If even smaller orientation changes are the target of your analysis or if you want to measure minute shape changes of the crystal lattice due to elastic strains, the standard band detect routines are insufficient. For such analyses you would need to use a pattern with more pixels and a dedicated technique based on cross correlation of sections of the diffraction patterns. For this tool, using many more pixels would appear to be better. But keep in mind that other variables in the system geometry such as the exact detector positioning, signal-to-noise level, lens artifacts, or pattern center calibration errors can introduce uncertainties that may easily exceed the improvements gained by using more pixels. In practice, patterns with 480 pixels or more have been used successfully. What you see is not always what you get. The above examples have highlighted a number of different uses of the word resolution and it appears that you have to be pretty careful in describing what you really want to accomplish. 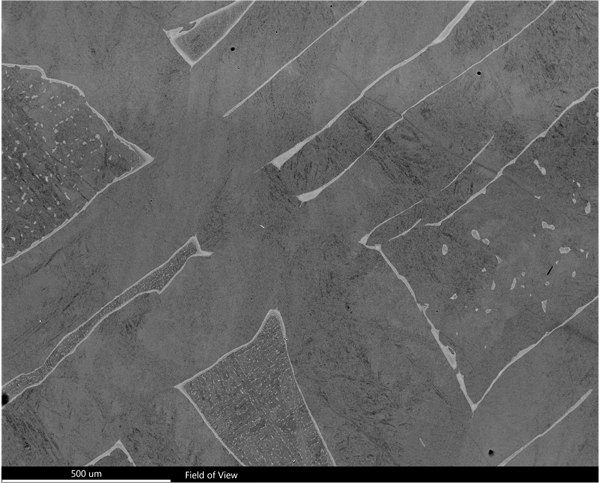 Going for a high resolution camera will not give you better spatial resolution in your EBSD maps. Similarly low resolution maps may be measured using a high resolution camera which shows that the number of pixels on your detector is totally independent of the spatial resolution that may be obtained on your samples. Therefore to conclude I would like to appeal to the last definition of resolution mentioned above: The action of solving a problem or contentious matter. 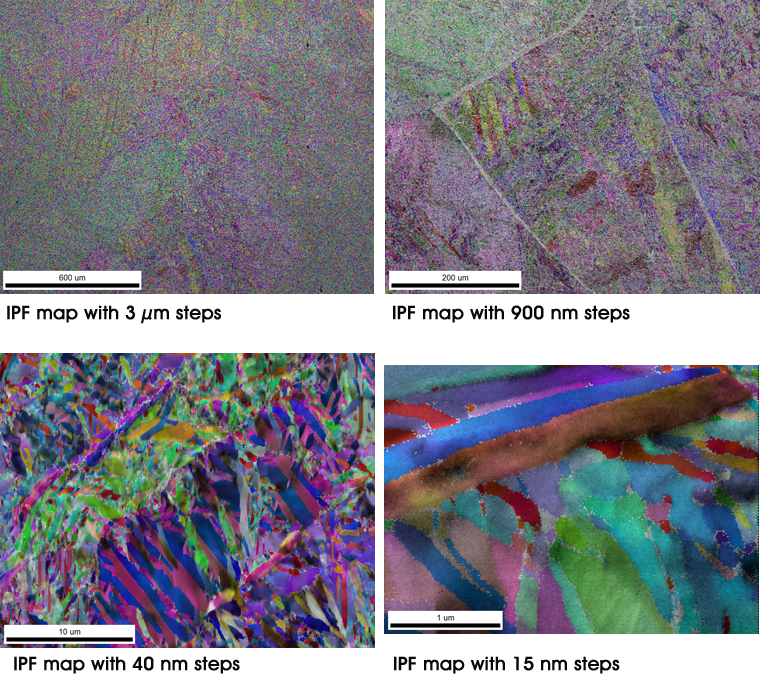 With the different meanings of resolution clouding the waters and creating confusion I would like to propose the use of “high resolution EBSD ” to describe the application of mapping with small step-size to resolve the fine details in a material. 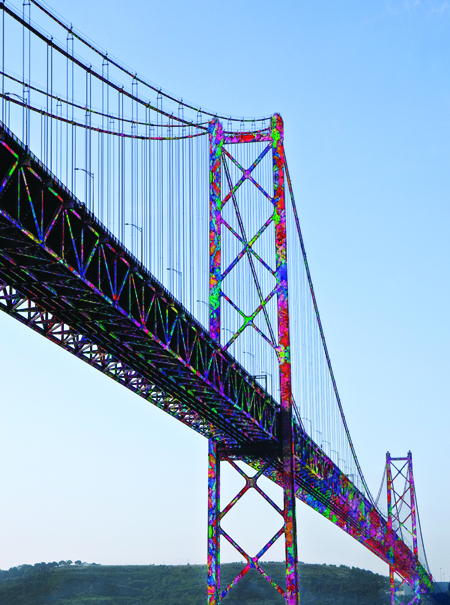 “High precision EBSD” would then describe the application to map out small orientation changes in a material in order to investigate and understand the deformation mechanisms and finally “high definition EBSD” to describe the technique of investigating minute changes in pattern geometry to characterize (elastic) strains in the crystal lattice by applying cross-correlation methods. Not too long ago, my daughter asked me to come to her school and give a talk about my job to her Career Investigation class. The dreaded “What do I do for a living” talk. Since I have never really been successful explaining that to family and friends who might actually be interested, I was not terribly optimistic that I would be successful with a group of teenagers who would be more interested in their phones, laptops and the class bell. Nevertheless, I decided to take on the challenge and try to make it something both interesting and helpful to them. I knew if I started talking about X-ray lines, Kikuchi patterns and (god forbid) quantification algorithms, I would lose them before I finished the first slide. At that point, I had to ask myself what excites me about my job…and it isn’t necessarily those things either. I really enjoy visiting our customers, and while we certainly talk about things like resolution and throughput, to me, it is the application of our products that is most exciting. What materials characterization problems are they solving? What process needs to be fixed, or monitored, or developed? What is the final product that they are trying to produce? Those are the really exciting things about my job at EDAX. We have customers in a great variety of markets, from automotive to zoology, and everywhere in between, and I’m lucky enough to meet and learn from many of them, and to know that EDAX helps them do their jobs better. So what do I do for a living? 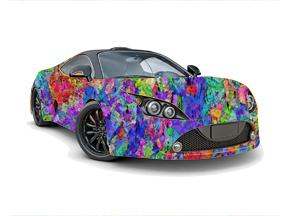 I don’t design sports cars, but I help make them lighter and more fuel efficient. I don’t build bridges or skyscrapers, but I help make them stronger and safer. I don’t discover new medicines, but I help make the process faster and more efficient to help people live longer and be healthier. Our mission at EDAX is to develop characterization tools to help people to solve the difficult problems and enable the next generation of technology. And that is pretty exciting to me.